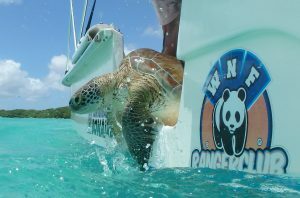 Twenty- six years ago Sea Turtle Conservation Bonaire (STCB) began monitoring the status of, and the threats to, Bonaire’s endangered and critically endangered sea turtles, using the resulting knowledge to protect them. Comprehensive local laws, as well as international treaties, now protect Bonaire’s sea turtles, their nests, and eggs from harvest and harassment. Today, the main threats to sea turtles are indirect; related to a rapidly increasing human population and the development that goes along with it. We no longer look at sea turtle conservation as a thing apart from society. To ensure a secure future for Bonaire’s sea turtles, we must address the issues that threaten sea turtles, biodiversity and social well-being, because they are inter-related. Sea turtles can only thrive when their ecosystems are healthy and the human community thrives. STCB is a non-profit, non-governmental organization and all funds raised from the Fundraising Auction will benefit STCB programs to protect endangered sea turtles. For more details please visit our main website www.bonaireturtles.org.